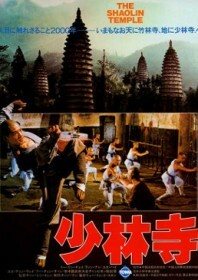 A rare Hong Kong production filmed in Mainland China and using the original Shaolin temple site – a luxury unafforded to Shaw Brothers and their Shaolin stories. This lavish production may be unashamedly patriotic but it’s also very convincing entertainment, and the balletic wushu choreography is just superb. The acclaim is mostly down to the talents of exciting 18 year old star Jet Li, who somehow performs like a seasoned veteran despite this being his debut film. Based on one of the many wall paintings which adorn the temple walls, Li plays a new Shaolin recruit who learns the martial arts to avenge his father’s death. Having known the secular world, he struggles to become a Buddhist monk and starts to retaliate. He joins a rebel collective determined to restore the true Tang emperor and displace the evil general in charge, who just happens to be the man at the centre of Jet’s own quest for revenge. Jet Li became an overnight sensation with this box office smash. The film is essentially a relentless repetition of fight scenes performed by an army of high class professionals at the peak of their talents. Studio: Chung Yuen Motion Picture Co.